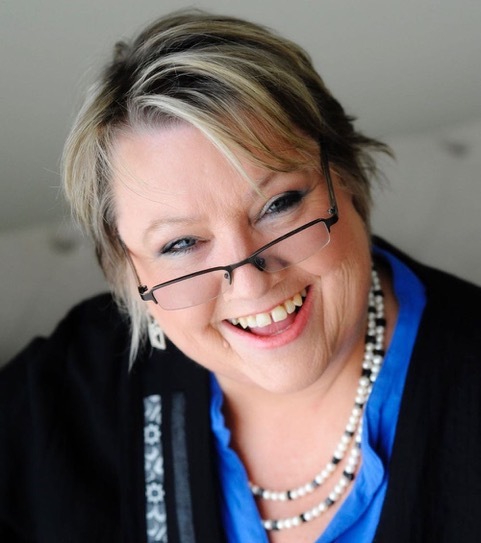 Anne Gracie has written another winner! Despite a kidnapping plot that comes distressingly close to melodrama with a villain who is little more than a handy device, the second marriage-of-convenience tale is a charming story of two likable characters who deserve their HEA. Edward is an appealing hero, a veteran of the Napoleonic Wars whose scars are deeper than anyone suspects. However, Lily is the heart of this book. She begins as a shy girl with a crippling lack of self-esteem, but as life tests her, she grows into a woman of strength and self-knowledge who has the courage and the wisdom she needs to fight for what she wants most. Lily totally won my heart. 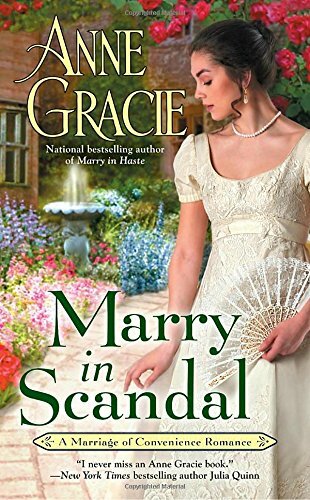 She is one of my favorite Gracie heroines, right up there with Kate Farleigh (Gallant Waif), Lady Helen “Nell” Freymore (His Captive Lady), and Daisy Chance (The Summer Bride). I had a bride doll that my godmother gave me when I was a child. She was about 30 inches tall and dressed in a beautiful white gown. Unfortunately, over the years of our moving to and from Europe, it got lost. I really wish I still had it. 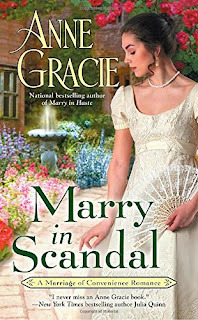 I enjoyed MARRY IN SCANDAL and found that Anne Gracie had created some really strong characters. If you read it, keep an eye on Georgiana. She's a funny gal and I would love to see a book written about her. I had a beautiful china doll that was a gift from an aunt. I "decorated" it quite enthusiastically with my mom's red lipstick. Yeah, probably a little too nice of a gift for someone as young as I was at the time. Oops! LOL on lipsticking the doll, PJ. I suspect quite a few of us did similar things. Sad to say, I have no memory of a beloved doll or toy but I cherished every book I could get my hands on. Catslady, apart from Teddy (pretty much the only one of my dolls or toys that survived our many moves, many of the beloved books came with us. They're like old friends to me. I had a bride doll and a Thumbelina doll that I loved. I don't remember ever having a bride doll though they were certainly popular. I loved my Chatty Cathy doll. I had that doll talking all the time! I never had a bride doll either, PJ, but Cheryl, a Thumbelina doll sounds pretty special. I never had a doll or a toy that I cherished. The only thing that I have left from my childhood is my lovely Black Beauty book. I still have two childhood hardback books that I treasure: my Shirley Temple's Storybook (a gift from my parents on my 9th Christmas) and 1001 Nights by Gertrude Chandler Warner (a gift from a dear family friend when I was 7 - her husband's niece designed and illustrated the book). Diane, I also have my (one) Black Beauty book, plus Flicka, The Silver Brumby series and many other horse and dog books. I didn't have a favorite doll, but I do remember having a Barbie doll & a Mary Poppins doll. I adored my Barbie! She debuted in 1959. I (and many of my friends) got one for Christmas in 1960 (we were 9 years old). Those Barbies sure were well loved. Barbie was the first doll I yearned for -- I must have been 10 or 11, but we'd moved and I was in a new school and Barbie was The Go. My parents didn't approve of Barbie, so they refused to let me have one. I wore them down, though and eventually I got one. The thing I liked best though was making the clothes. My childhood dog was a favorite playmate too. She was well-loved for 16 years. Natasha, when dogs do that they take a little piece of or heart with them. I did not have a favorite doll, but loved a stuffed bunny rabbit. I still have a floppy-eared stuffed puppy from my childhood. I don't remember playing with it (I was only two or three) but have been told I carried it everywhere. Stuffed animals are so comforting, don't you think? Patty, I had (and still have) a stuffed rabbit called Snoodle, that was made by my dad's friend while he was in hospital recuperating for a long time. Sadly, Snoodle was rarely played with. Teddy and the real animals got all my attention. Yes! My Hello Kitty plush toy, which I still keep. So many memories. Sounds gorgeous, Lubnaa. I went through a phase of making plush toys when I was about 12. Isn't Anne Gracie a delightful guest as well as a wonderful author? Santa brought me a doll every Christmas until I entered my teens, and my aunts gave me many other dolls. I don't remember being particularly attached to any of them. I did have a teddy bear that I loved, but he arrived with a box of chocolates when I was seventeen, a Valentine's Day gift from a boyfriend. The bear outlasted the bf. LOL My favorite "toy" was my chalkboard I used from ages six through nine to teach my younger sister everything I learned in school. And I still have quite a few tattered books from my childhood, including Louisa May Alcott's Little Women, Little Men, Jo's Boys, and An Old Fashioned Girl. Books were always my first choice. LOL! I had a few of those stuffed animals that outlasted the boyfriend too. I love that your cherished "toy" was a chalkboard! My favorite doll was a blond cabbage patch kid when I was little - as I grew up I loved to play softball, so I would have to by glove. LOL. When my niece and nephew were young we took them to Babyland General Hospital in Cleveland, GA where Cabbage Patch kids are "born." What a fun experience! Mine was a favorite teddy bear. It survived a house fire but was considered unable to be cleaned of the smoke and suit. However, the cleaning company heard how disappointed I was since it was the last item I received before my father died. They had another go at it and managed to get it cleaned so it could be cleared for cuddling. And they repaired a rip before it's return to me! I'm so glad they were able to clean and return your bear to you. Lil, I LOVE that story. I'm so glad they were able to clean poor Teddy up and give him back to you. I still have my Teddy and he's a bit bald, and his paws are patched and he only has one eye, and I still love him. So much childhood love and angst and secrets poured into one little bear. I had a monkey and I loved him. I was too much a tomboy to play with a doll. And while it is true, boys, for some reason, are admittedly found to be dyslexic,it does cover all genders and socio-econmical genres, women where thought to be unreachable more often and less was tried on them. Boys were often taught how to remember things or memorize things, more than girls were. My brother had a stuffed monkey he carried everywhere. Loved that thing! Amy, I was a tomboy too, and that's probably why I had animals instead of dolls— real ones as well as Teddy and Snoodle-the-rabbit (who I neglected) I've taught adults how to read most of my life (both as a voluntary activity and later as a paid job) and you're right -- though reading disabilities are more common in boys, girls are by no means immune. I remember Mrs. Beasley well. I watched Family Affair every week. I still have the first doll given to me when I was a baby. So it is about 65 years old. My mother repaired it for me as one of her arms fell off because I dragged the doll around everywhere. My mother taught all 4 of her children to love reading. My stuffed puppy is about the same age. I love how many of us had mothers who passed down a love of reading to their children. Mine also came from my book-loving father. I love those much-repaired, much-beloved toys. My parents also gave me a love of reading, and they and my older siblings read aloud when I was a toddler. I couldn't wait to do that myself. My favorite was The Talking Chrissy doll. You could actually pull the hair to make it grow. It had reddish brown hair, which was so different from my blonde hair. I loved that doll. Oh wow, that sounds like fun, Pamela. I also wanted to have auburn hair. Funny how we so often want what we don't have. Di, dolls were usually hard, so I'm not surprised you didn't sleep with yours. 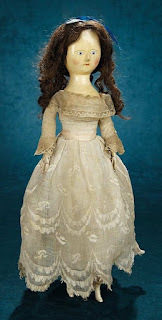 And even though I don't even remember whether I had any dolls — I suppose I must have but there's no memory of them -- I loved to make little rooms and houses in shoe boxes. I had a doll but never got attached to it. I preferred reading and books were my treasures. I have much clearer memories of books too. Traveler, I'm with you —as are most of the readers of this blog, I suspect. Books were and still are my treasures. I enjoyed playing with a tea set but I cannot remember any doll which was special for me. Instead I enjoyed books from very young and cherished my collection. I don't think I ever had a tea set. At least, I don't remember one. Oh yes, the dolls' tea-party — I remember having those with friends. Was Teddy allowed? I don't remember. But I do recall the delight of those tiny cups and tea pot and the miniature food. Such fun. Like so many others, books were more treasured than any of my toys. I don't remember having more than one doll. My mother was opposed to us having gender specific toys and had a major hissy fit every time my sister or I asked for a Barbie doll. I didn't like dolls, so I had a green ball that I pushed around in a baby carriage, fed in a high chair, and (of course) played with as a regular ball. Janette I LOVE the thought of you and your green ball. Clearly you were a wonderfully imaginative child. I was blessed that both my mother and grandmother were talented seamstresses. They made doll cloths, stuffed animals and rag dolls. My sister still has a few treasured toys. I held on to my teddy bear all the way to adulthood. Cecilia, my godmother fulfilled that role in my childhood and taught me to make plush toys and dolls clothes. And I still have my teddy, too. I think I had a blanket that went everywhere with me. When I was older it was a stuffed pink elephant or a book. Lovely, Eileen. I can imagine the comfort a "blankie" gave. Cannot remember a favorite toy as a little kid, but when I was older, loved my Nancy Drew, Trixie Belden, Beverly Cleary, Maud Hart Lovelace and Eleanor Estes books; could not get enuf of them. Patoct, I think those early books made us the voracious readers we are today. Yes they did, tried to get my daughter to read as a kid, but she had her own taste and same with my granddaughter. LOL. I had a baby doll as a child that I loved. I see ones just like her in antique stores today. (That is depressing.) My grandmother had repainted the features on the head and made a small wardrobe for her. It was my prized possession. Inexplicably it went missing when we moved just a few miles away when I was in seventh grade. The only two things that disappeared were my doll and a doll house. I never did find her or what happened to her. I still have the clothes my grandmother made for her. Patricia, that's sad that your wonderful and her clothes and house went missing. Might your parents have privately decided you were too old for dolls? I had a toy with a secret compartment that was given to me when we lived in Scotland. I loved the secret compartment and hid some of my special treasures in it, but Mum decided it wasn't important and left it behind. How sad for you. Treasures from our childhood are important to us. We may be too old to play with them, but they hold many wonderful memories. My mom had a small collection of dolls from when she was a little girl and I loved playing with them! Funny, I hadn't thought about them in years. Thank you for helping me remember such a cherished memory. Thanks, MsAwesome, I'm really enjoying these comments. They've sparked a lot of memories for me, too. My favourite toys were not dolls, but a stuffed teddy bear and cat, and, later, toy trucks and tractors. I loved books from very early in my childhood. As my mother was a children's librarian before her marriage, she picked excellent books for my brothers and me, starting with books like The Little White Teddy Bear or The Velveteen Rabbit and progressing to the Narnia series. Anne, I think books create a wonderful legacy for a child, in memories, habits created, and a life-long love of reading. When an author friend of mine first became a grandmother, a group of us sent her a collection of favorite books — not for the granddaughter, but for Grandma, to keep at her place for little visitors. Barbie was my favorite doll as a little girl. Thanks Denise, she was very popular, wasn't she? I wonder, was it the first time a doll came already named? I had a doll called Pitiful Pearl who I loved dearly. Also had a smaller Shirley Temple doll who had lots of outfits ...my mom's friend Rose sewed her a lot of clothes. Oh, I love the sound of Pitiful Pearl — what an interesting name. And how nice of Rose to sew your Shirley Temple doll those clothes. Oh, Anne, I dressed up my dogs too. My mom told me that one day when it got a little too quiet she went into the kitchen to find our two dogs and cat each on their own kitchen chair (in a row no less) dressed up in hats and shawls, sitting there, patiently waiting for me to come back!